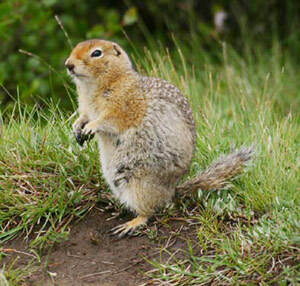 Arctic Ground Squirrel is the largest species of Ground Squirrels in North America. They belong to the Sciuridae family. This small mammal easily survives very cold winter seasons. 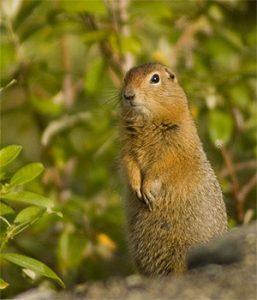 Like most of the ground squirrel, these creatures live in scattered colonies. The body of this squirrel is covered with reddish or tan fur with white spots on its back. They are 1 – 1.5 feet in length and weighs around 550 – 850 grams. The undersides of its legs are light brown in color. They have a small line of white fur surrounding the eyes and have a bushy tail, which is around 3.5 inch long. Males are generally heavier and larger than females. Most of their population is found in Alaska. In Canada, it is found in the Northwest Territory, Northern British Columbia and Yukon Territory. Some of its population is also found in few parts of Siberia. The primary habitat of this squirrel is Arctic tundra. This species stay in well vegetated bushy areas. They prefer to live in sandy soil areas so that they can dig their burrow easily. They live in riverbanks, lakeshores, sandbanks, mountain slopes, tundra ridges and meadows. The hibernation of this creature starts in late August or early September and continues till April. During this period, they feed on the foods, which they store during summer. In the burrow, they tuck their head down to the legs and toss the tail over its head. Their body temperature drops during this period. 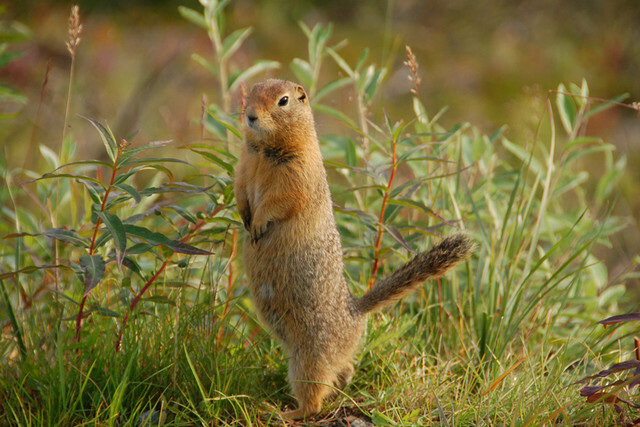 Arctic Ground Squirrel is the only mammal, whose body temperature goes below freezing point. Unlike other hibernators, they do not dig below the frost line. Instead, they spend their hibernation period in a temperature that goes down to -23 degree C. Their hibernation period may last up to seven months. They lost 20%-30% of their bodyweight in this time. These squirrels live in colonies of around 10 – 50. A single colony has some dominant males, who control the territory. Males mark the territory by using its scent gland. The colony of this species live in borrows, which are usually dug 2 – 3 feet under the ground. All the burrows are connected in a series of tunnels. While foraging, they frequently stops and look out for danger. During the reproduction period, the males fight with each other over females. Sometime, the males immigrate to other colonies. They are hardly spotted in the morning. They usually became active during afternoon and evening. They prefer to stay in burrows in rainy or cloudy days. Arctic Ground Squirrels are herbivore animal. They feed on a wide variety of plants and twig that includes grasses, flowers, roots, stalks, leaves, mushrooms, bog rushes, seeds and berries. During the summer time, they gather seeds, leaves and berries and bring it to their burrow. These creatures are opportunistic feeders. If other foods are not available, they will eat almost anything. Arctic Ground Squirrel reaches its sexual maturity within 11 months. Their reproduction starts in March-April, just after the hibernation period and continues till May. After a gestation period of around 25 – 30 days, 5 – 10 young are born. The eyes of a hairless new born do not open for at least three weeks. The young ones are feed by their mothers. 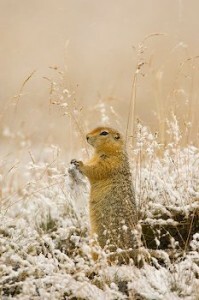 The Arctic Ground Squirrels become independent within two months. This creature is known to live around 7 – 10 years. The lifespan of males are shorter than females. The main predator of this animal is Grizzly bear. Their predators also include eagles, wolverine, wolves, arctic fox and owls. This Squirrel is very vocal. Their call sounds like ‘ssik-ssik’. This ‘ssik’ sound generally signals the presence of a predator nearby. They can even produce different sounds for different predators. Short guttural chatters are used for avian predators and low guttural sound indicates other predators. In the past, these species are sought after for their meat and fur. If a female is killed by predators after producing her offspring, other females tend to protect the orphaned offspring. During the winter, Grizzlies tend to dig their winter burrow and feast on them. The lack of big trees in their habitat allows them to spot the predators quite easily. Most Yukoners, call this creature “gopher”. They are one of the least concerned species (according to IUCN), since they are found in large numbers in their natural habitat.